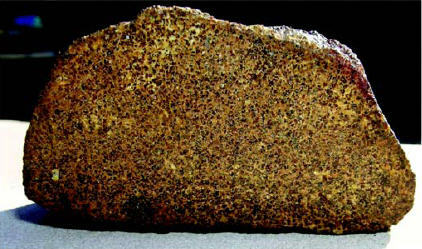 History and physical characteristics: A complete 219 g stone with no crust was purchased in Erfoud, Morocco, in November 2005. Petrography: (T. Bunch and J. Wittke, NAU) Contains millimeter-size pigeonite with exsolved augite lamellae surrounded by recrystallized plagioclase and minor amounts of relict plagioclase of similar composition. Mineral composition: Pigeonite (Fs64.8Wo6.1), FeO/MnO = 64; augite (Fs44.2Wo27.3); plagioclase (An84.0–86.8). Abundant chromite is observed. The sample also contains minor amounts of Zn-bearing FeS, Cr-ulvöspinel, silica, and phosphate. Classification: Achondrite (ungrouped); minimal shock and weathering. This meteorite is paired with NWA 2400 and NWA 011. Although no oxygen isotopic data have yet been obtained, the petrography is essentially identical to these two meteorites. Type specimen: A 23.2 g sample is on deposit at NAU. MFarmer and Strope hold the main mass. The polished cut surface of a hand sample of NWA 2976, with the longest axis ~4 cm.